The KONG Cat - Feather Teaser is an interactive cat toy featuring a stuffed animal connected to a rod. Contains catnip for added stimulation. This toy advances the natural behaviour of your cat and will provide ample fun. The Feather Teaser by KONG offers endless fun for cats. It encourages natural behaviour and the added catnip will stimulate further play. The cute stuffed animal is attached by a rope to a rod offering unexpected movements and triggers a cat's natural hunting instincts. Use this toy under supervision, only! 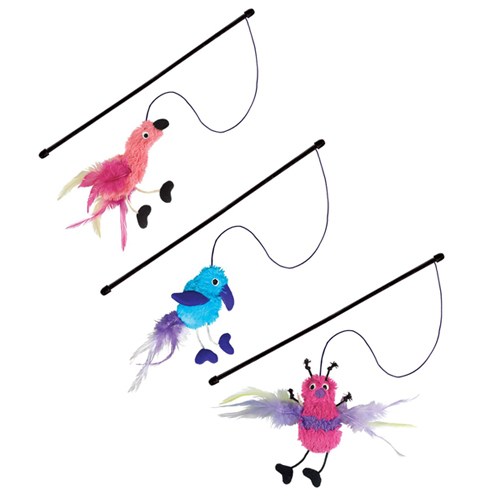 The KONG Cat - Feather Teaser is available as a butterfly, bluebird or flamingo. Please note: This product is selected at random. You cannot select one of the figures. You will receive either the butterfly, bluebird or flamingo. Have you used KONG Cat - Feather Teaser before? Let us know what you think about this product.